Three periods of regular instruction per week are scheduled for all students in 7th through 10th grade. In 11th and 12th grade, students meet once a week for a double-period of P.E..
P.E. is taught in groups which are composed of different class sections with students of different cultural and language background. The application of various organizational methods promotes permanent interaction and cooperation between students. 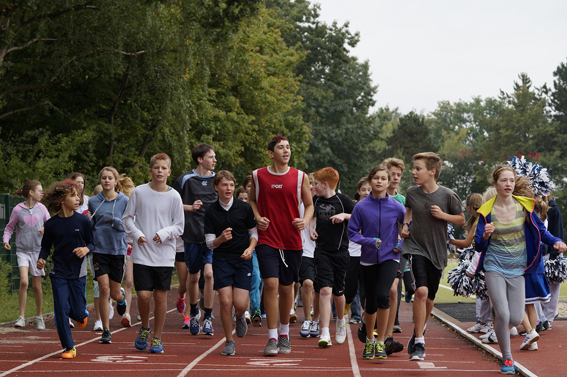 The Sports Department uses the German Curriculum (Rahmenplan) as its foundation and supplements the program to enhance the benefits for the students. Therefore, the special JFKS curriculum includes a wide variety of sport disciplines from both the German and American cultures. Typical American Sports (American Football, Flag Football, Softball, Lacrosse, Basketball, Cross Country) as well as typical German Sports (Apparatus Gymnastics, Team Handball, Soccer) are offered. The German curriculum provides general guidelines allowing for teacher flexibility.